AirPcap-Nx is end of life (EOL) with no direct replacement. AirPcap Nx, an optimized USB-based capture and injection device for Windows platforms, delivers complete visibility into 802.11a/b/g/n wireless networks and guarantees superior capture performance with minimal packet loss, especially when doing multi-channel capture on 802.11n networks. This unique, dual-band device supports 802.11n, 802.11a/b/g legacy modes, and 4.9 GHz US Public safety channels and offers full Wireshark integration, 2 x 2 MIMO, two internal antennas and two integrated MC-Card connectors for optional external antennas to enhance performance in the most demanding environments. AirPcap Nx adapters are easily run under VMWare on a Macintosh or Linux machine (or a VM session within Windows). The AirPcap Nx USB adapter comes with two 2.4GHz 5dBi antennas, two MC-Card to SMA cable assemblies and the AirPcap driver. 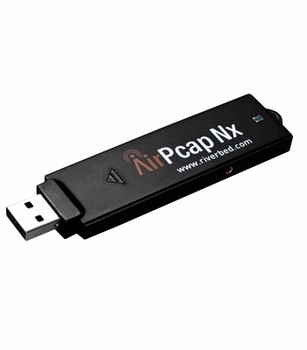 The AirPcap Nx product includes the AirPcap USB 2.0 adapter and the AirPcap Software Distribution. The Software Distribution contains the AirPcap Windows driver, Installation and User's Guides, the Wireshark Network Analyzer, and a collection of developer resources for users interested in including wireless capture directly into their applications.